A central eight-pointed blue star is set in a red square with a lattice border, surrounded by pseudo Kufic motifs placed alternately. The pseudo inscription of the border is derived from al-mulk, 'the kingdom'. The textile has a radiocarbon date of 1189 Ad +/- 34, with a calibrated range of 1210 to 1300. It is likely to be of Mamluk date. 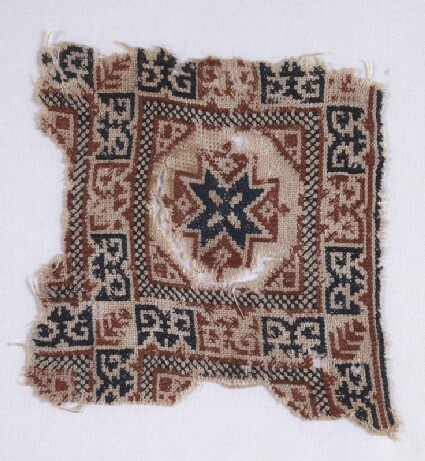 The immediate impression given by this fragment is that its geometric design is remarkably like the Roman mosaic floor patterns based on stars within squares. The design can also be compared to the more elaborate compositions with eight-pointed stars within octagons seen on 16th century Mamluk carpets. It is intriguing to see the way the design has been built up from the central star within an octagon, within another square surrounded by a border and then multiplied to form a larger pattern. On closer inspection we realise that the repeating motif in the border is ultimately derived from kufic script. It is similar to that seen on fragment No.18 [EA1993.76] and could be derived from the Arabic words for "health" or possibly from "Allah". 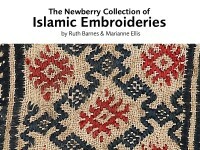 The embroidery is worked in spaced cross stitch and close counted herringbone stitch as seen on No.39 [EA1993.153]. 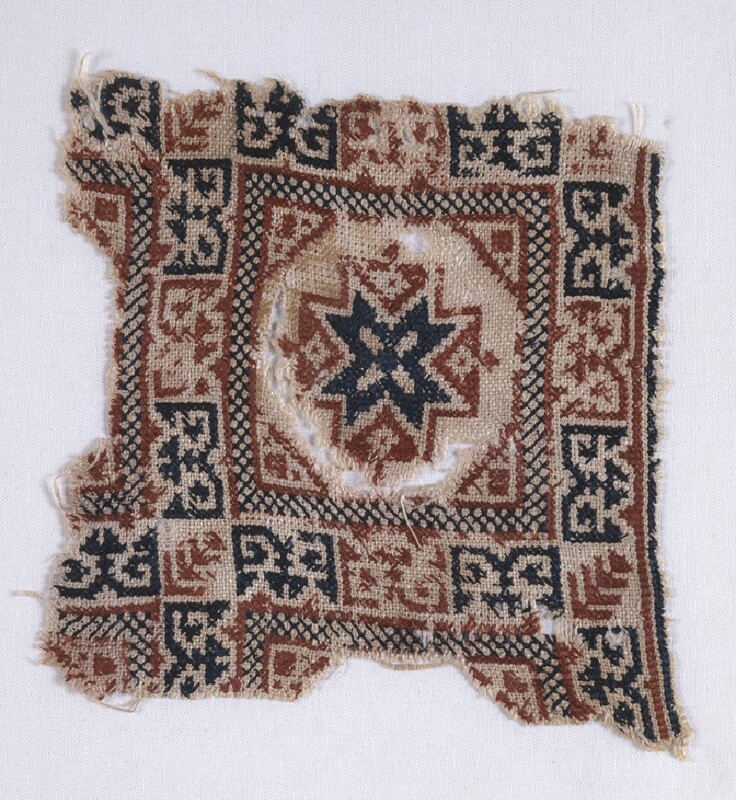 Here it functions as both a line and a filling stitch and is found on a wide range of designs broadly similar to those worked in pattern darning and double running during the Mamluk period.